It is very difficult for European Catholics to make sense of the polarization within the Catholic Church in the United States. I grew up in Northern Italy and studied and worked for almost 20 years at the University of Bologna, my alma mater and the oldest university in Europe, founded in 1088. In the second half of the 20th century, the Catholic Church in Western Europe existed within a political environment split between strong Socialist and Communist Parties and an equally strong Christian-Democratic Party, which was strongly supported by the church. Not all Catholics voted for this party, however; in fact, the percentage of Catholics who were members of the Christian-Democratic Party had been steadily declining. Today this party exists with the same political relevance of 60 years ago only in Germany. Despite this political polarization in these European countries, the tension did not result in theological polarization among Catholics. In the political and cultural environment of the 1960s, when European Catholicism still set the standard for world Catholicism, the Second Vatican Council represented (especially in Italy) an opening, a kind of thaw, that made it possible to build bridges among different political cultures. So to me, as a Catholic, a scholar and a recent immigrant to the United States, the issue of polarization within Catholicism in this country—a country with historical and political experience so unlike Europe—is important. It is worthwhile, first of all, to remember that it is a very recent development for the Catholic magisterium to accept the idea that Catholics can have a political culture, much less different political cultures. The Catholic march toward democracy was a long one. After the shock of the revolutions of the late 18th and mid-19th centuries, politics was seen as the result of the separation of the modern world from the moral guidance of the one true church. Catholic politicians were allowed to do business with the modern world only de facto, as a practical necessity, because for the church hierarchy it seemed too embarrassing to be directly involved with a political realm they did not acknowledge as legitimate. In many cases, however, embarrassment was overcome, and the international politics of the Vatican trumped the political orientations of Catholics. The rise of Italian Fascism, for example, resulted in part from the fact that Catholics were not allowed to have political cultures or a political party of their own. Only during Vatican II did the church recognize that modernity exists and that Catholics live not only in the church, but also in society and in political communities that in many places had recently become democratic. This was one of the “signs of the times.” A fundamental call to unity, both ecumenical and interreligious, helped inspire the Second Vatican Council. The fathers and theologians of the Council recognized in modernity a moment of advancement toward unity, and they saw the church as one of the agents for the promotion of this unity. The council also renewed Catholic engagement in politics by elaborating a set of principles that Catholics should follow in a democratic public arena. The goal of democracy, according to Vatican II, is not procedural but must be measured by its ability to meet the demands of a human dignity the church proclaims as closely connected to the “social nature” of the human person. In light of the extraordinary past year for the Catholic Church, we must ask whether the election of Pope Francis might signal an end to the polarization within the church in the United States. The resignation of Pope Benedict XVI marks the end of popes who were involved in the debates at Vatican II. As the broader ecclesial context shifts, however, Catholics in the United States continue to live and work within the political and cultural structures of this country, which have both contributed to a vibrant and important church and have also produced a few challenges that will continue to affect the intra-Catholic debate in the United States. Here I will list a few issues relevant to the polarization I see in this country. The Constitution. The free exercise and non-establishment clauses of the First Amendment allow for an interesting interplay between religion and politics in the United States. The political views of an individual often relate closely to his or her religious views and vice versa. Many denominations in the United States have experienced a history of adjustment and change according to the always evolving relationship between political and religious views, and Catholics in the United States are not above this phenomenon. The internal debate. The second largest religious group in United States is former Catholics. Notwithstanding the ever growing size of what Martin E. Marty called “the American Catholic Alumni Society,” Catholics in this country have not left the church at the same rate as European Catholics. In other words, the rise of a critical mass against—or at least questioning—the institutional church has become part of the internal debate within Catholicism. In Europe, the debate is characterized as pitting a clergy-led Catholicism against a more secular landscape. Competitive democracy. From its beginning the church in the United States has lived in close contact with democracy, and a democratic ethos has become part of its culture. But the United States offers a particular type of democratic environment. Democracy here is not consensual, as it is in European democracies with multiparty alliances; it is competitive—that is, there are two alternative political parties. This environment has affected the ethos of participation in the church, which is often driven by competitive, oppositional views more than by consensual instincts. Ecclesial actors (hierarchy, laity, theologians, Catholic think tanks, universities and so forth) take part in this interaction as competitors. This analysis also clarifies why the “non-negotiable values” became more important among Catholics in the United States than anywhere else. Some bishops explicitly criticized the Catholic Common Ground Initiative, founded by Cardinal Joseph Bernardin of Chicago in 1996 to help facilitate dialogue among Catholics who hold different political and theological perspectives. Today the function of consensus-building has been visibly lacking at all levels of the church in the United States. Political cultures. There are many scholarly studies on the impact of electoral systems on the political behavior of a country, and the political behavior of Catholics in the United States, but there are very few on the impact of the electoral system on the political cultures of Catholics in a given country. In simple terms, the existence of a two-party political and electoral system has given birth in these last few decades (among other factors) to something resembling a two-party Catholic Church. In countries where Catholics live in multiparty systems, different theological identities are much more difficult to absorb into the political discourse and partisan narratives, so the church is not as divided. Political labels. The increasing political polarization in the United States has only exacerbated the political divide within the church. In U.S. politics, Republican means conservative, and Democrat means liberal. This dichotomy is clearly felt in how Catholics engage with each other about issues in the church. Those who invoke Vatican II are labeled “liberal,” and it is “conservative” to refer to the magisterium. Of course, this dichotomy is only possible if we accept an extremely simplified (and more political than theological) understanding of an ecumenical council and the teaching of the church. This kind of polarization among Catholics is not present in Europe. In most European countries with a large Catholic population, political compromise—in the noblest sense of the word—has always been part of the political reception of the magisterial documents of the teaching office of the church—for example, in the excommunication of Communists in 1949 and its impact on Italy, and the reception of “Humanae Vitae” (1968) and other teachings on the so-called life issues. In the face of an extremely polarized and paralyzed political life in the United States, I understand the temptation for a Catholic retrenchment into an alternative structure—a move from political engagement with the state or government into a world of small communities—more traditional and radical than what conventional politics offers Catholics today. There is an acutely perceived political homelessness among Catholics in the United States, and I greatly admire the conviction of Catholics who want to rebuild ecclesial communities and local networks of social services, a vision expressed in the pages of America by theologians like William T. Cavanaugh (“The Root of Evil,” 7/29/2013) and Michael Baxter (“Murray’s Mistake,” 9/23/2013). The political challenges in the United States, however, cannot justify withdrawal by Catholics from the polis as we know it. Following this path entails many problems. First, a withdrawal from the affairs of the nation-state might lead Catholics in the United States to something like the early communities of Christians; but in a European context, where there have been established churches, a withdrawal from the nation-state risks a return to the wars of religion that ravaged Europe for at least a century. Second, a retrenchment of Catholicism in the form of resistance against the modern state implies a radical rethinking of the Catholic view of the “political,” which paradoxically augments the “Americanist” taste of Catholicism and makes the polarization even more serious. And third, a retrenchment would move Catholicism intellectually and spiritually toward a sectarian mind-set that is impossible to reconcile with the “universal” claim at the heart of Catholicism. As a historian, I do not need to be convinced of the destructiveness of public power and its temptation to absorb every aspect of life in a manner that is not even comparable to the times of the empires. Nevertheless, I also believe that the modern state is the last anchor against much more destructive forces, and I fear that Catholic theology might soon become the victim of an anti-political sentiment that contradicts recent papal teaching about service in political life. In “Evangelii Gaudium,” Pope Francis writes, “Politics, though often denigrated, remains a lofty vocation and one of the highest forms of charity, inasmuch as it seeks the common good.” This endeavor is worth the investment of the whole church. Fifteen years ago, Cardinal Francis George of Chicago famously said, “Liberal Catholicism is an exhausted project.” No one expects Pope Francis to refer to any part of the church as an “exhausted project,” but his social radicalism is surely exhausting the spin doctors active in various Catholic think tanks who expect him to endorse a full slate of their positions. In this time of change in the church, the rediscovery of a common ground is necessary, especially as some Catholics attached to the social-political language of the last two pontificates find it difficult to articulate, under Pope Francis, a language for their “faithful dissent” from the magisterium of the church. The crisis of the engagement of many Catholics in politics is one of the symptoms of the crisis of the idea of politics as one of the highest forms of charity, because it serves the common good. But the Catholic Church is one of the last defenders of the potentially humanizing effect of politics, and of the potentially dehumanizing effect of a community of Christians closing in on itself. The question for Catholics is not whether to engage with the state and one another, but what defines this engagement. The particular challenge for Catholics in the United States is to overcome the temptation to see everything as a competition between two camps, whether in politics or among Catholics. The election of Pope Francis is perhaps the signal that the future of Catholicism consists less of apocalypse and division and more of prophecy and unity. With parochial and Jesuit education leading to a degree in Political Science/International Relations, I am intrigued and perplexed by Professor Faggioli's essay. In brief, my conviction is that Catholic Dogma -- Transubstantiation, Seven Sacraments, etc. -- is cast in stone. Catholic teachings and concerns, especially on social issues -- capitalism, hunger management, even priest pedophilia, etc. -- are current; they are important in varying degrees, but subject to change (capital punishment was acceptable by the Church under "proper" circumstances, in the 1950's; today it is not). So, if embrace or rejection of Catholic doctrine is the measure of Church membership, the issue of polarization is simple: embrace the doctrine, you're Catholic; reject it, you're not. Social/political issues rarely define Church membership, although some issues are pretty serious: actively support and promote the practice of abortion, and you're probably out; turn a blind eye to it, and you're probably still in the fold, even if engaging in cognitive dissonance. Politics played a significant role in the saga of Christ's crucifixion. Politics is still a disrupter or a uniter today, and routinely is a factor in current Church teaching. The ultimate measure of politics, whether it rises to the level of heresy, is Church doctrine. Before that level, politics and teaching will always be sparring partners, if not best friends. Nice try. People, supported by a loyalty tested hierarchy, are strongly committed to preserving the past devotionalism of the 1950's church in America. Thus Vatican II and everything following is suspect; new was not a page in the old catechism. Vernacular was vulgar and could never express anything sacred. Sacraments were not so much for sharing as for adoration. Everything was construed under the auspices of the "narrow way." Last time I was in Europe, it was clear to me that Catholic practice and devotion was reserved to older women and children. 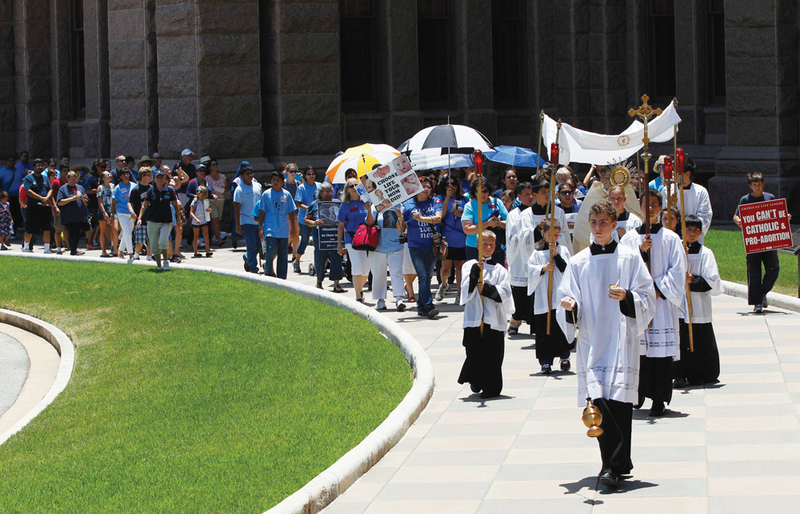 The loyalty to the church and Catholic faith is wrapped up in each parish's or country's favorite saint celebration; attendance at other times is sparse and dreary. Europe has a museum church. Hence, the bulk of its Catholic people are museum participants - praise for past glory, apology for mistakes, but little to say about present life. There is a very unfortunate mind-set in both Europe and the US in particular - namely putting Cathoics in pre-determined categories - for example traditionalist and liberals, those who accept Vatican Two or resist it, favour Paul VI's mass or reject it. This so often hardens into political positions: trads vote Republican, libs vote Democrat. Even in the UK, which I visit regularly from France, there is all too often the assumption that if you are a Trad promoting the Tridentine Mass you can't be a wholehearted supporter of Vatican II. This assumption is all too common among both trads and libs. This ideological divide is exactly what Benedict XVI sought to end - he of course accepted the documents of Vatican II (when taken for what they say, not for what some say that they mean), he accepted the Paul VI mass (when celebrated as intended) and made generous provision for the Tridentine Mass (which many believe sets a standard of holiness). In my opinion Catholics would do well to forward Benedict XVI intention finally to end this very damaging split between trads and libs - a house divided cannot stand. Lets get on with job with Pope Francis - facing the modern world together and bringing it the Good News. No political party in Europe or America stands for what the church teaches - we should vote for the one we think is least bad - and abortion is not the only issue. You've gone half way to a sober response to this essay (essay of sorts: it's sort of half an essay: the proof of the dividedness of the US Church is sort of half there), Mike. But the Gleichschaltung ("synchronization", a term employed during Naziism, where even the German Boy Scouts had to bear the party logo) of the US church is not merely a sectarian issue involving a reactionary leadership, test of the faithful's sycophancy, etc.. There is the overarching Gleichschaltung installed across US society by the war on terror, and its agenda (genocide, racism, xenophobia, anti-intellectualism) have reached into the Catholic Church in the US as they have into every other aspect of what Ray McGovern's essay a few weeks ago reminded us to call "the third estate", which I broaden to include academia and counselors along side the denominational churches. That might be called the death of politics and the replacement of it by ideology, corresponding to the death of debate and its replacement by the party line. Is it remarkable that this has occurred in the US without any bodies turning up in gutters with bullet holes in the backs of their heads or necks, or did Europe's own descent(s) into totalitarianism here and there over the past hundred years also occur generally voluntarily? An observer from Italy might have a lot to tell us about that. This article also appeared in print, under the headline "A View From Abroad," in the February 24, 2014 issue. Massimo Faggioli is an assistant professor of theology at the University of St. Thomas in St. Paul, Minn. This essay is adapted from the annual Cardinal Bernardin Lecture, given at the University of South Carolina in Columbia on Oct. 7, 2013.